You’ve probably realised that I’m a big fan of working smart not hard. Anyway, I’ve got quite a few emails recently asking me how it’s possibly to grab yourself a significant advantage in the grizzly world of affiliate marketing. So I’ve put together a fr-ee mini-report. A case study really of one of the ways I do it. 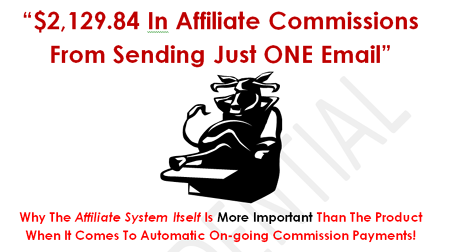 This method brought me $2,129.84 in commissions from mailing just a small part of my list just once, perhaps twice (can’t remember) back in February this year. The affiliate system then took over and did the rest, sending me weekly payments that are STILL arriving. Not a vast amount I’m sure you’ll agree but we’re talking potential here guys, not figures. And anyway a couple of grand is always handy to fund a new project or campaign. I’ll show you why you should concentrate on the affiliate system rather than the product you promote. And I’ll also show you how you can do this without a list too. It’s just a bit of fun – a ‘behind the scenes’ nosey about for my readers. Some of you are probably well aware of using this sort of approach, but others may not be so this is for you guys. I’d love to hear your comments, views and experiences below! Interesting report. As you say it’s mostly common sense but it doesn’t help to be reminded of such things every once in a while. This works …Thanks Tony…i enjoyed the report…i also got your toad ugly squeeze page and your other offerings…I will be following you closely….